In a recent popular story, “Have You Deleted Your Facebook Account Yet?” we discussed how Cambridge Analytica, a political data firm hired by President Trump’s 2016 election campaign, gained access to private information on what is now more than 87 million Facebook users. Facebook is insisting that the Cambridge incident was not a data breach, but maintains that Cambridge crossed the line and broke the rules when they provided the information to a political consulting firm. They reported this week that the breach actually effected 37 million more accounts than originally reported, bringing the total to more than 87 million. Cambridge Analytica first denied that they had obtained or used Facebook data, then changed their story claiming they deleted the information when they realized they were in violation of Facebook’s rules. Facebook also said they demanded and received certification that the data had been destroyed, but now say they recently received reports that not all the data was deleted. This debacle has led to a Federal Trade Commission investigation and calls from Congress and British Parliament for Facebook founder and CEO Mark Zuckerberg to appear before them over the incident, with hundreds of thousands of Facebook users also claiming they plan to delete their accounts. Zuckerberg is expected to testify this week. So, how has Facebook handled this crisis, and how appropriate and effective was their initial response? What do you think? 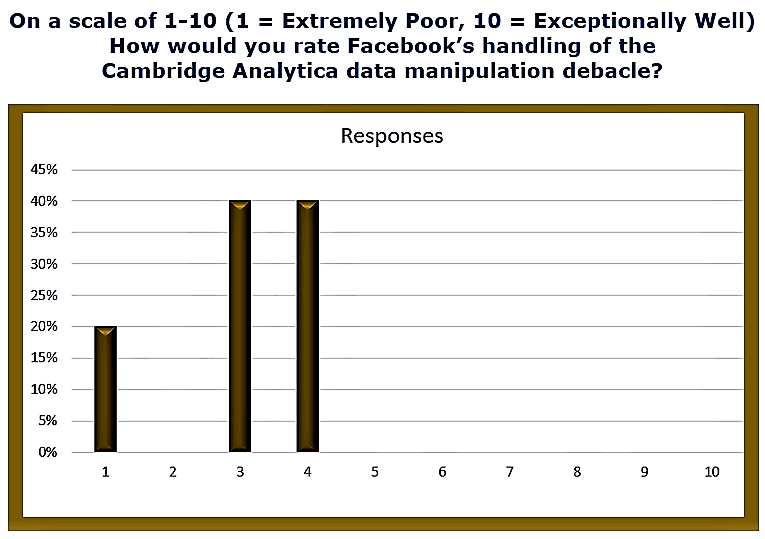 Our survey participants strongly believe that Facebook could have done a much better job in handling the Cambridge Analytica data incident, giving Facebook extremely poor marks for their decisions. Approximately 84 percent of respondents reported that their trust in Facebook has been impacted, and they have some concerns that additional firms may have also inappropriately gained access to private user information, with 60 percent indicating that they have serious concerns, and 24 percent stating that they have some concerns. Approximately 16 percent say that they are sure at this point and will wait for additional information. All of the respondents who indicate that they have a Facebook account are holding a “wait-and-see” outlook on whether they will keep or delete their accounts and are not sure of their final decision, holding out for additional information on the situation. 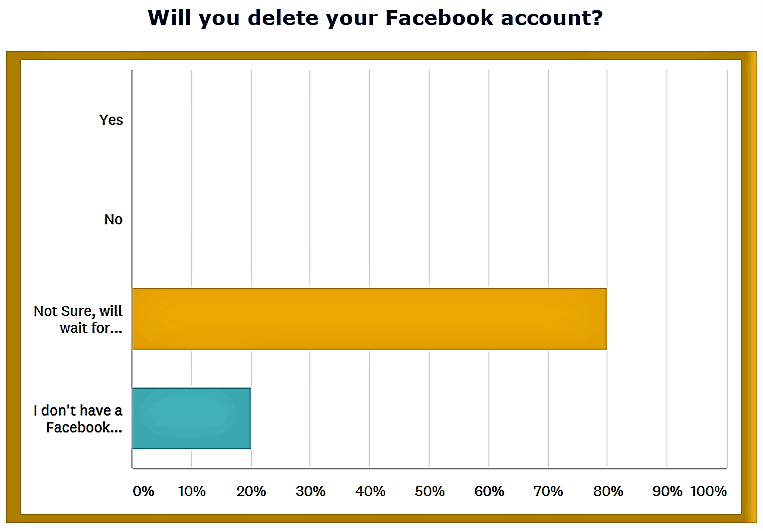 20 percent of respondents indicated that they do not have a Facebook account at the current time. Do you have any additional thoughts? Let us know what’s on your mind.